These fellows are not idiots to keep bank accounts in their names. They would have consulted the best financial brains employed at firms such as KPMG, Earnst & Young on how to set up shell companies with bogus addresses and fake directors and registered in safe heavens well out of reach from our mundane sleuths of the FCID. The world of shady money is a well established institution pioneered by the greats such as London and New York. Every despot knows where to invest his ill gotten gains where he or she is guaranteed never to get caught. There are many Rajapakshe owned business establishments in Sri Lanka accept that you would never know they are the real owners wink wink. Nandana Lokuwithana the owner of the Dubai Marriot is one of those fronts. So Namal baby is correct there is no money in any bank under his name in Dubai stupid. There is one man who can unlock Pandoras box who just got bailed from Jail. Lets hope there is enough sense among the present GOV to offer him an inducement that will make him sing. 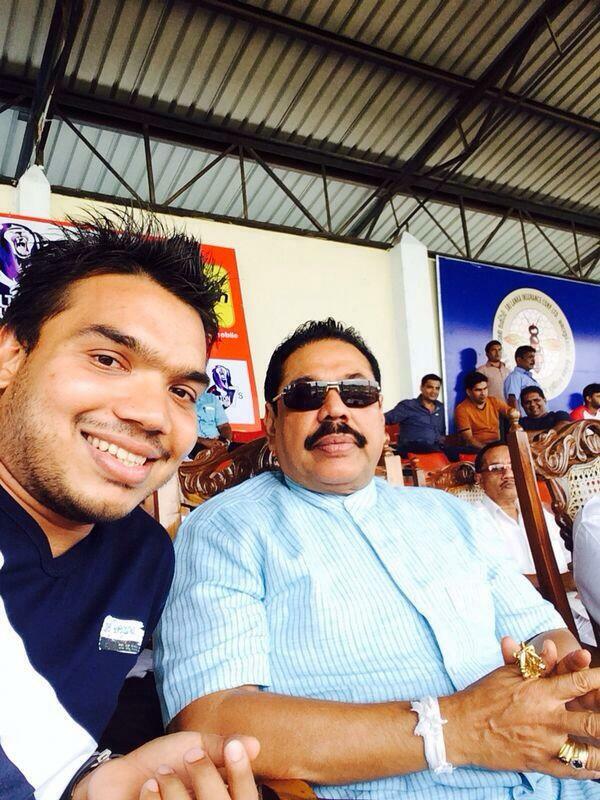 “We Don’t Have US $500 M Bank Account In Dubai”:- Namal Rajapaksa. The Bank Accounts in Dubai and Elsewhere, hold several Millions more than just 5M. Nandana Lokuwithana who is the owner of Marriot Dubai invested Rajapakse family money that was bank rolled (money laundering) to purchase this Hotel.The reward for this was Lokuwithana being allowed to purchase the former Steel Corporation for a song and runs this company as Lan Wa as a monopoly with costly advertisements.This does not end here .Lokuwithana was to buy Lanka Mineral Sands Company gfor a song with pay offs to the Rajapakse family arranged by the Chairman who was Namal Baba’s class mate at St. Thomas college.When one of the Additional Secretary to the Minstry of State Enterprise Development under Basil Rajapakse Mr. Willie Gamage objected, he was assaulted and thrown out of the Board Room.When Willie Gamage complained to Mahinda Rajapakse a confidant of the President, Gamage was promised to look into this but had to move out of the Ministry and the Board of the Mineral Sands Company due to pressure from Namal Baba.The Yahapalayana should investigate all these frauds and put the Rajapakses berhind bars soon to win the confidence of the people .It is also suggested to appoint an International Tribunal as in Egypt to catch all the Rajapakse family members including the sons , wife , brothers, brother in law and cousins etc (Rajapakse Family Tree) and his henchmen the Modawamsa , Cardbaoad Sando (Dinesh) , Bandula , Pivituru guy, Allaha etc and all should face an International Tribunal.The justification that these culprits won the war is no excuse for ripping off this poor country.Field Marshall Fonseka the War hero will give evidence against the killing of civilians as well as those who held white flags when they wanted to surrender.Why did the Security Forces kill Prabakaran without capturing him alive as this would have resolved all the allegations aginst the Government for killing civilians?